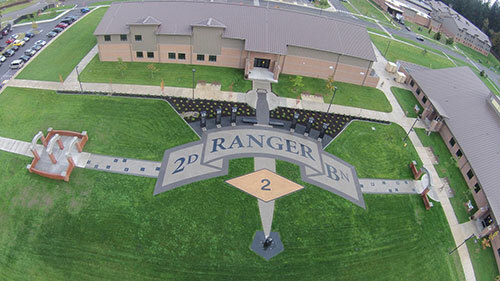 To remember our fallen heroes and pay tribute to the achievements and sacrifices of the men and families of 2nd Ranger Battalion, a memorial park was built in their honor. 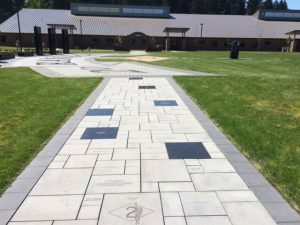 Constructed of granite and stone, inscribed with the names of Rangers who died in combat and training, the memorial is landscaped into a reflective setting–a physical reminder of Ranger selfless service befitting those that made the ultimate sacrifice. BoldIQ is proud to be part of this great heritage and tradition. 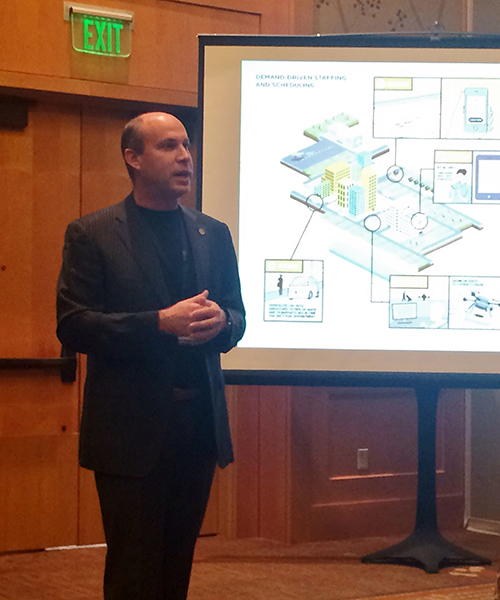 Roei Ganzarski, president & CEO of BoldIQ shared with the audience of the 3rd annual Seattle Biz-Tech conference, what the convergence of Big Data, Fast Data, Dynamic Operations, and Internet of Things looks like. Ganzarski shared the vision and the reality of how real-time optimization software, like that offered by BoldIQ, is shaping today’s reality into tomorrow’s intelligent future. Home visits by nurses, driverless transportation, deliveries by drone, and repairs to your washing machine, all coordinated and scheduled efficiently by a centralized dynamic optimization system. The convergence of Big Data, Fast Data, Dynamic Operations, and Mobility, all around Real-Time Optimization, was the topic of discussion at BoldIQ CEO’s presentation at Big Data Bellevue. In front of a ‘BigData-centric’ crowd, Roei Ganzarski presented a vision for a fully integrated, automated, and optimized future while sharing how current technologies and a pro-active design, will ensure such a future in fact comes to be. Bellevue-based BoldIQ is committed to doing only what it is good at, which is helping companies optimize their resources. BoldIQ created a software platform that evaluates demand and its constraints, supply, and the environment surrounding a company, and produces a plan for the best use of resources to solve a problem. The platform is most easily applied to transportation solutions, but the company also is looking at improving the efficiency of the healthcare and energy systems. The software accepts a series of inputs about resources available, such as the number of taxi cabs, airplanes, or hospital beds; the constraints, such as weather, traffic, available doctors, or road closures; and the demand, such as cargo, patients, or travelers, and provides a plan to achieve the optimum efficiency. As the variables change, the software modifies the plan. It’s about “practice what you preach” for Ganzarski when it comes to optimizing BoldIQ’s own resources and people. It’s easy for young companies to get distracted by the array of problems in the marketplace and try to fix them all, but Ganzarski said that’s how some companies get into trouble. 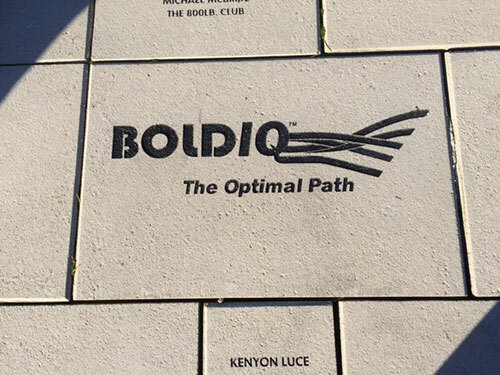 BoldIQ’s mission of doing only what the company is good at is more than just a customer-facing initiative. The company translates that mission internally as well, where all 12 employees focus on product development. Ganzarski hires external firms to handle other tasks of running a company, such as finances, marketing, sales, legal, and human resources. The company was founded in Seattle, but when it needed more office space, Ganzarski moved the headquarters to Bellevue to accommodate its employees, most of whom live on the Eastside. Ganzarski puts a lot of effort into ensuring employees have a balance between their work and home lives. The same thought process is applied to vacation time, which is unlimited for BoldIQ employees. Roei Ganzarski, President & CEO of BoldIQ, will speak at the 3rd annual Seattle Biz-Tech Summit on the topic of the convergence of Mobility and the Internet of Things. His focus will be around the mobile workforce, transportation, and real-time time decision making. Seattle Biz-Tech Summit is the premier international business and technology conference hosting influential executives, investors, developers, entrepreneurs, and industry leaders to highlight and promote the benefits of business exchanges, technology collaboration, and global innovation between the United States and China. The third annual Seattle Biz-Tech Summit will mirror the theme, “Entrepreneurship, Global Investment, and Technology Innovations.” Sessions for 2015 will continue to focus on cutting-edge technology topics in Cyber Security, Mobile Development, IoT, Digital Marketing and E-commerce and more. New to this year is the Seattle Startup Challenge, this dynamic pitch contest will emphasize the importance of continual growth among the startup community in the Pacific Northwest by connecting participants to investors from Seattle, Silicon Valley, and China. Seattle Biz-Tech Summit is dedicated to helping grow technology and business relationships throughout the world. Join us as we showcase the value in Seattle’s unique ecosystem through expanding the platform for discovering new business connections, partnership possibilities, and investment opportunities. Seattle’s miserable traffic has an upside. It’s spurring local entrepreneurs to try to reinvent the way you commute. Seattle’s stuck in traffic. It’s turning to software to break free. Heeding that S.O.S., investors are pouring millions of dollars into the business sector known as smart mobility — tech firms that share cars and rides, deliver meals and connect roads, transit and parking — all en route to the coming landscape of self-driving cars and aerial drones. 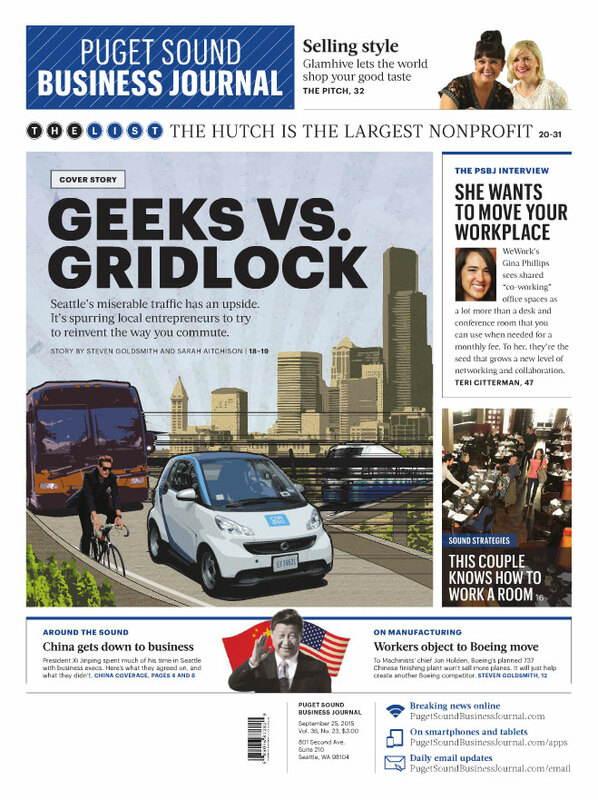 Kirkland-based Inrix, Seattle’s Pavia Systems, Bellevue transportation firm BoldIQ and even Seattle’s Pronto Cycles are all working — in very different ways — to unclog crowded streets both here and elsewhere. If these and other companies are successful, the region’s tech entrepreneurs could develop a reputation for creating technology that solves one of the most maddening, time-consuming and money-losing propositions — sitting in traffic. The financial opportunities for these companies are huge. A recent Texas A&M Transportation Institute study found that traffic congestion caused drivers to waste more than 3 billion gallons of fuel and kept travelers stuck in their cars for nearly 7 billion extra hours. The total nationwide price tag is $160 billion. Commercial truckers lose more than $30 billion annually. In the Puget Sound region, drivers spend 63 extra hours a year stuck in traffic — the seventh-worst in the United States. 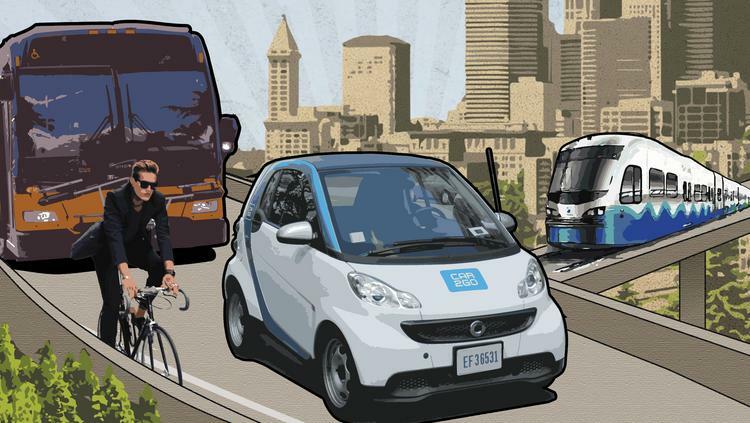 BoldIQ CEO Roei Ganzarski called the Seattle area one of the nation’s top five hotbeds for smart mobility. “This region has a beautiful mix of really bad gridlock, a very quickly growing population and a tremendously active entrepreneurial community,” he said.Those entrepreneurs increasingly also team up with old-school public agencies that run buses, paint parking spaces and build roads. Such public-private mashups occur at Pavia Systems, whose app makes state highway inspectors more efficient, and Inrix, which just got hired by the government of Denmark to monitor that entire nation’s traffic in real time. “Governments are saying, ‘We have to tap the benefits of the private sector,’” said Chris DeVore, partner at seed-stage investment firm Founders’ Co-op and director of Techstars Seattle. DeVore noticed the most applications ever last year for funding from companies partnering with government agencies, including transportation tech. Estimates vary on the financial potential of smart mobility, as do definitions of what the sector encompasses — whether to count food delivery apps, for instance. It’s hard to find a tech company that doesn’t have some transportation play in its garage, especially if it wants to work with industry leaders Google and Apple — both of which are getting ready to build their own “connected” cars. In 11 funding rounds, San Francisco ride-sharing colossus Uber has raised nearly $7 billion. To grab its dominant market role, Uber has had to persuade municipalities to unlock decades of regulations protecting taxis and limousines from competition. Seattle was one of 51 jurisdictions, at last count, to allow ride-share companies after Mayor Ed Murray negotiated a compromise that offered some concessions to taxis. Kaleb Miller, who worked at the pioneering Car-Share Portland in the 1990s, now serves as Seattle general manager for the largest car-share service in the world, Boston-based Zipcar. He’s part of an industry that’s grown by 41 percent every year since 2010. Zipcar works with public transit agencies to make it easier for residents to get around without clogging the streets with a personal vehicle. About 60 percent of Zipcar’s customers have a transit pass, and a quarter of users ditched their personal vehicles after joining. It’s an example of how public and private players increasingly drive parallel routes. A typical industry “hybrid” is Ted Trepanier, director of product management at Kirkland’s Inrix. Before joining the firm, he spent a quarter-century at the Washington state Department of Transportation. To unclog traffic, Trepanier said, the public and private sectors will need still deeper interaction. Though not a household name like Uber, Inrix draws on serious resources. The traffic data firm has more than 300 employees and was valued at $550 million in its most recent funding round, led by Porsche. The company provides back end data for more than 400 customers in 42 countries. A smaller-scale success story in public-private collaboration is Pavia, whose software relays real-time information on potholes and other road and bridge repair needs. The startup recently pulled in $3 million from investors and landed deals with the Washington state Department of Transportation and other agencies. Bridge and road inspectors use Pavia’s app to log problems and compose reports using the cloud. Where is all this leading? Possibly to a world where taking a single mode of transportation is an outmoded idea. Demi Allen, general manager of Seattle’s Pronto Cycles — a nonprofit that runs the region’s biccycle-sharing system — paints a future in which a commuter, using a single prepaid card, will hop on a bike share to a park-and-ride, pop on light rail and then use Zipcar to travel from the transit stop to work. But how is a mere human to sort through all those options? At Bellevue’s BoldIQ, “dynamic-optimization” software is already saving delivery services 30 percent to 60 percent in costs by using artificial intelligence to sidestep ever-changing traffic clogs and recalculate routes as new orders arrive. BoldIQ has helped trucking companies make routes more efficient and cut down on fuel usage. Ganzarski’s 12-employee company is on track to triple in revenue this year, after already tripling last year. That doesn’t mean anyone thinks gridlock will vanish at the click of an app. In fact, Ganzarski believes that popular ride-share services such as Uber and Lyft actually worsen traffic congestion by sending squadrons of driver-only cars trolling around for the occasional passenger. A better way, he said, would be to arm taxicab companies with sophisticated technology to deploy cabs at utmost efficiency. Howard Jennings, manager of Arlington, Virginia-based transportation demand management company Mobility Labs, also sees an obstacle-laden route to clearing America’s highways, especially because any road that’s traffic-free never stays that way for long. A few years ago, Jenkins’ organization began inviting young transportation entrepreneurs to monthly meetups. The group now has 900 members. “There’s private sector innovation just busting out,” Jenkins said. 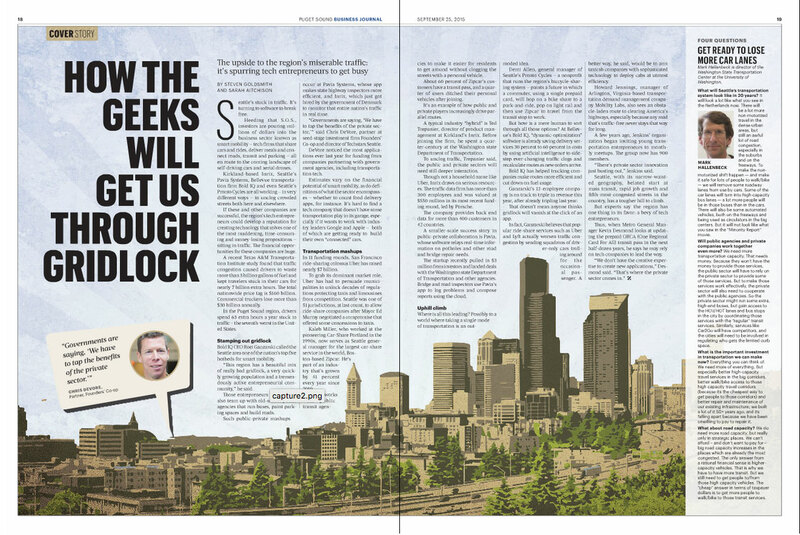 Seattle, with its narrow-waisted geography, belated start at mass transit, rapid job growth and fifth-most-congested streets in the country, has a tougher hill to climb. But experts say the region has one thing in its favor: a bevy of tech entrepreneurs. Thus, when Metro General Manager Kevin Desmond looks at updating the prepaid ORCA (One Regional Card For All) transit pass in the next half-dozen years, he says he may rely on tech companies to lead the way. Mike Christensen is a life-long software engineer — a career that began remarkably early. While most of his kindergarten peers were mastering their ABCs and 123s, he was programing his first computer to count to 10. When he was 18, Christensen began working for Microsoft as a software engineer. After his 11-year tenure there, he began pursuing his passion for machine learning. That startup, KitchenPC, didn’t find the right fit in the consumer market, and Christensen decided instead to open-source all the technology behind the project. He now works for data solution startup BoldIQ. He balances his highly technical work life with CrossFit, hiking, and travel. Meet our Geek of the Week, and continue reading for his answers to our questionnaire. What do you do, and why do you do it? “I’m currently a Senior Software Engineer at BoldIQ. We optimize things – in other words, we take your problem, look at all your data, take into consideration all your constraints and then use software to figure out the optimal solution. In aviation, we can find optimal crew schedules that eliminate unnecessary flights. In ground transportation, we can figure out what order you should pick up and drop off packages. We can continually optimize these scenarios as conditions change or new data comes in. Your role models: “Bill Gates – one of the smartest men alive, and he created an entire industry. There’s a lot of billionaires that just want to see how rich they can get. Gates is devoting his life to eradicating disease, eliminating third world poverty and improving education. He’s using his geek skills to accomplish all of that. Big Data Bellevue will take place at Inome headquarters in Bellevue, WA. On the third Wednesday of each month, an industry leader in Big Data gives a presentation followed by a lively discussion on big data technology and its impact on business world. Big data is everywhere. Entire companies have sprung up saying they can produce it, mine it, slice it, dice it, present it, sell it, and even make predictions based on it. And just about every company is examining how they can leverage their data to reduce costs, increase productivity and produce new revenue. Companies are spending a lot of time, effort, and resources to find that holy grail of data. Even though data mining and analytical tools have the ability to potentially predict some sort of future, these are no more than diamonds in the rough. Data pros know they are worth something to their operation (potentially a lot), but most people don’t know what to do to turn that data into action. It’s rare to find an organization that is not wasting the true potential of big data. How do you know if your company is wasting this diamond mine? You can’t react to disruptions in real-time. Operations should be able to adapt in real-time to produce the best possible outcomes given changes and disruptions that occur. When something breaks down in your resource chain, or when new demand comes in, the data at your disposal should turn actionable and provide you with updated operational plans. You rely on human intuition vs using data to make intelligent, informed, and integrated decisions. Even with the best big data and predictive analytics systems, many companies are still using intuition to make their final operational decisions. This is very limiting and does not maximize the value of the data available. Our human minds can only retain and analyze so much information at once, and do so in a consistent, scalable, and repeatable manner. If your data is not working for you in real-time, all the time, dynamically generating the most optimal decision for your operation at any point in time, regardless of changes and disruptions, then it’s time to rethink your data strategy. Smart cities, aka Intelligent Cities, may sound futuristic. Actually, most of the technology needed to make them happen already exists and is being deployed to varying degrees in cities around the globe. In the not-so-distant future, the Collaborative Economy, sophisticated automation technologies, the Internet of Things and big data will converge to make everyday life very different than it is today. Don’t worry, we’re not all going to suddenly give our cities a makeover, Jetsons-style. Instead, these technologies are embedded in things we already have – like cars, bridges and roads, smartphones, lightbulbs, just about everything actually. To give you an idea of how our ordinary cities will start their journey to smartdom, take a look at the infographic below by BoldIQ. It’s all about personally owning very little, sharing almost everything and optimizing everything we do through the use of smart data, real-time analytics and automation. Odds are that your own city is waking up now, sensing things – such as movement and user demands it once was blind to – and beginning to respond. That will increase over time as existing technologies are plugged in or modified throughout your area. Pretty cool, huh. We are the masters of our world and our technology proves it. Of course, new tech is being developed every day, but you have to admit this is an impressive start towards a brighter, better future.